The Côted'Azur, often known in English as the French Rivera, is the Mediterranean coastline of the southeast corner of France, also including the sovereign state of Monaco. There is no official boundary, but it is usually considered to extend from the Italian border in the east all the way up to Saint-Tropez. This spectacular coastline was one of the first modern resort areas. 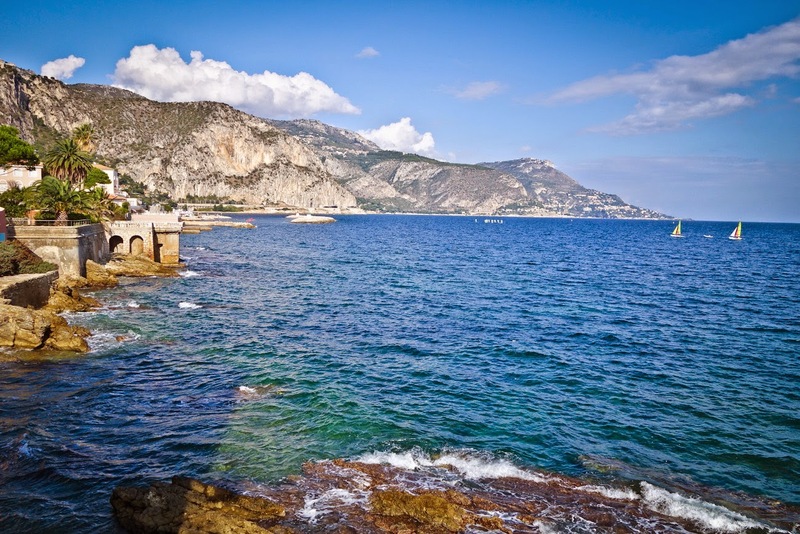 Cote d'azur, (its name translates to "blue coast" referring to the azur blue waters of the area), began as a winter health resort for the wealthy high society Brits at the end of the 18th century. With the arrival of the railway in the mid-19th century, during the Belle Époque era, it became the playground and vacation spot of wealthy British, Russian, and other aristocrats, such as Queen Victoria and King Edward VII. In the summer, it also played home to many members of the Rothschild family. 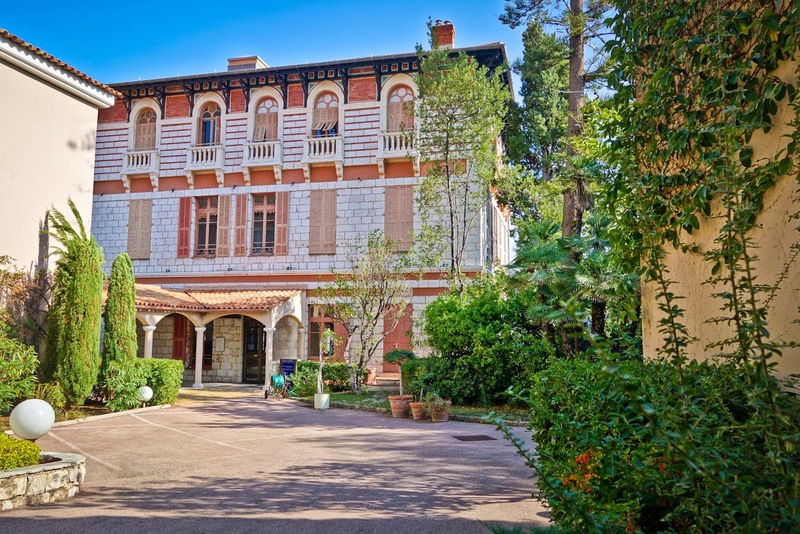 However, one member of the Rothschild family in particular truly set the bar and standard of homes along the Côte d'Azur when she build a dream villa in Saint-Jean-Cap-Ferrat, the villa of Baroness Béatrice Ephrussi de Rothschild. Born in 1864, Béatrice was the daughter of the banker and major art collector Baron Alphonse de Rothschild (a title given to Alphonse and his brothers by the Emperor of Austria). Béatrice was known for her beauty (and her wealth) and it was no surprise she had a line of eager suiters. At 19 years old, she married Maurice Ephrussi, a Parisian banker originally from Russia who was a friend of her parents and 15 years her senior. The marriage quickly turned to disaster for Béatrice, as she caught a serious illness from Maurice, which prevented her from having children. Maurice was a big gambler and in 1904 his debts amounted to more than 12 million gold francs, the equivalent of 30 million euros today. Worried about the future, the Rothschild family decided to take Maurice to court to demand a separation. They won the case and, in June 1904, after 21 years of marriage, Béatrice de Rothschild and Maurice Ephrussi were separated. The following year, Béatrice’s father died and she inherited a fabulous fortune (700 million euros). 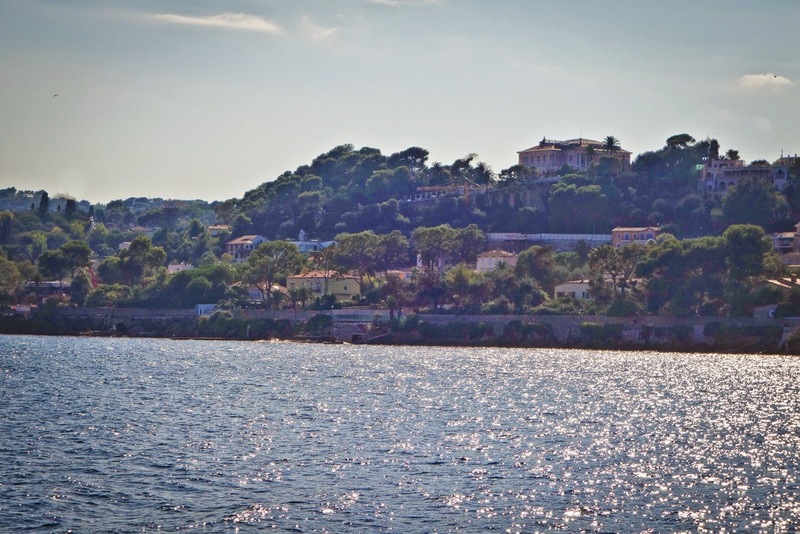 It was at this time, age 40, that she decided to build a paradisiacal villa in Saint-Jean-Cap-Ferrat. She made this her winter residence from 1912 onwards and came here regularly for over ten years, during which she split her time between Paris, Monaco and Deauville. In 1933, one year before her death, Béatrice bequeathed her Villa and all of her collections to the Académie des Beaux-Arts. Today one can visit her Villa and get a sense of who she was and how she lived. Like her father, Béatrice was an avid art collector and assembled a huge collection of furniture, paintings and porcelain from the Eighteenth-Century France, her passion. Her infatuation with the French monarchy ran deep and at the villa you can see her impressive collection which includes furniture and decorative arts etc. 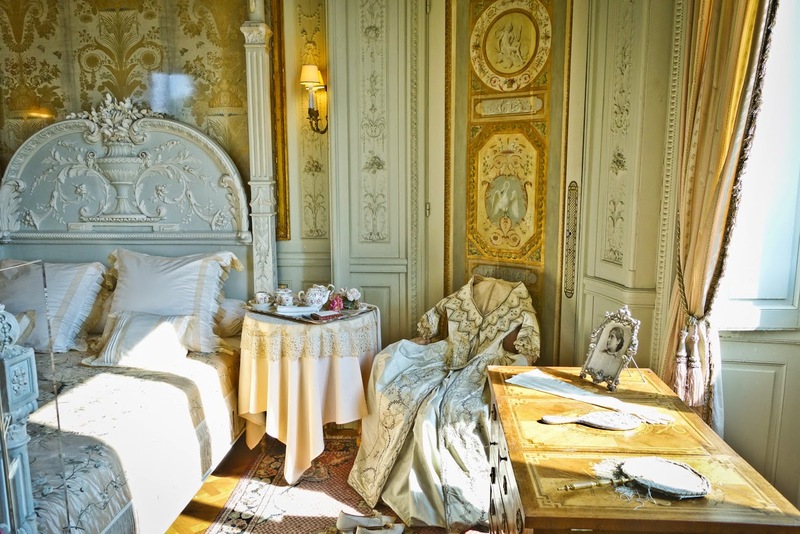 that once belonged to the French kings like Louis the IV and Marie Antoinette. 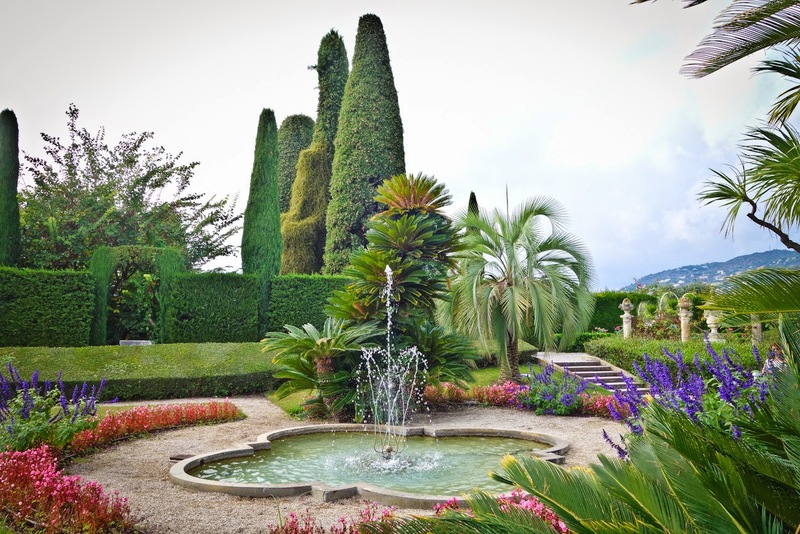 As impressive as her art collection is, it is truly the gardens of the villa that are astonishing. One could spend an entire afternoon exploring the incredible one of a kind grounds. 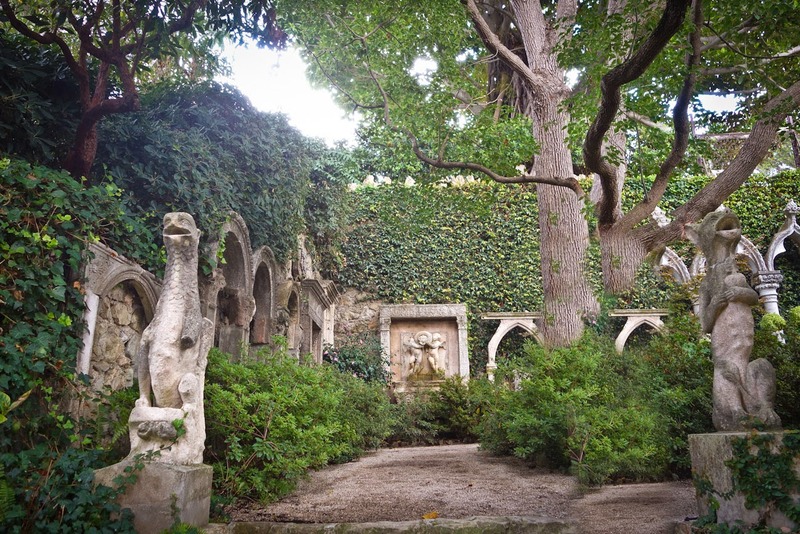 The 8 gardens (and temple of love) which make up the estate include a Spanish Garden, Florentine Garden, Stone Garden, Japanese Garden, Exotic Garden, Rose Garden, Provencal Garden and the French Garden. Each one meticulously engineered and entirely unique from one another. The magic of the gardens is heightened by the musical fountains that bring to life the Grand Bassin. Every ten minutes, the "Great Peacock", the 'Waltz" the "Tulip" and other gyroscopic displays present their memorable choreography of water. And if the gardens don't knock your sock off, the views of the sea will. Due to the location of the villa, one can see the sea from every spot of the house or grounds. 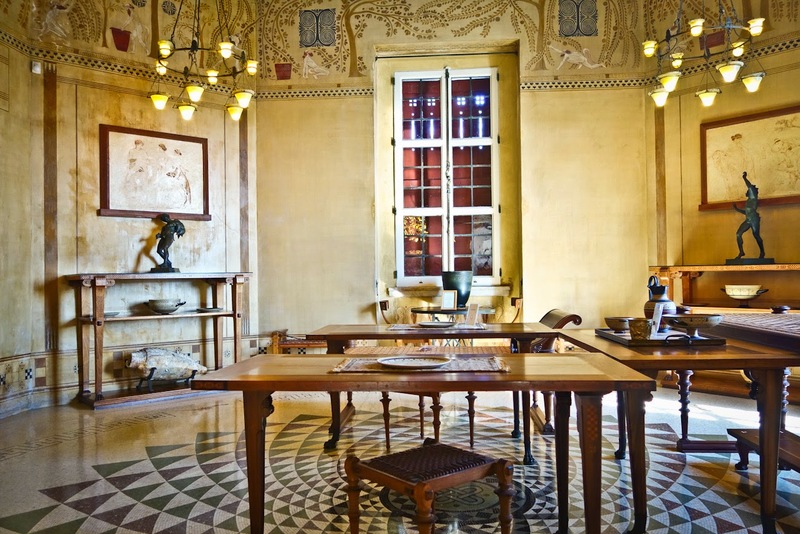 Although the Villa is property of the L'Académie des beaux-arts, part of the Institut de France, since 1991 the villa has been managed and promoted by Culturespaces, a company specializing in the management of museums and historical monuments. The Villa is open to the public 365 day a year from 10 a.m to 6 p.m, except: July and August: from 10 a.m to 7 p.m. From November to February: from Monday to Friday from 2 p.m to 6 p.m. / weekends and holidays from 10 a.m to 6 p.m. 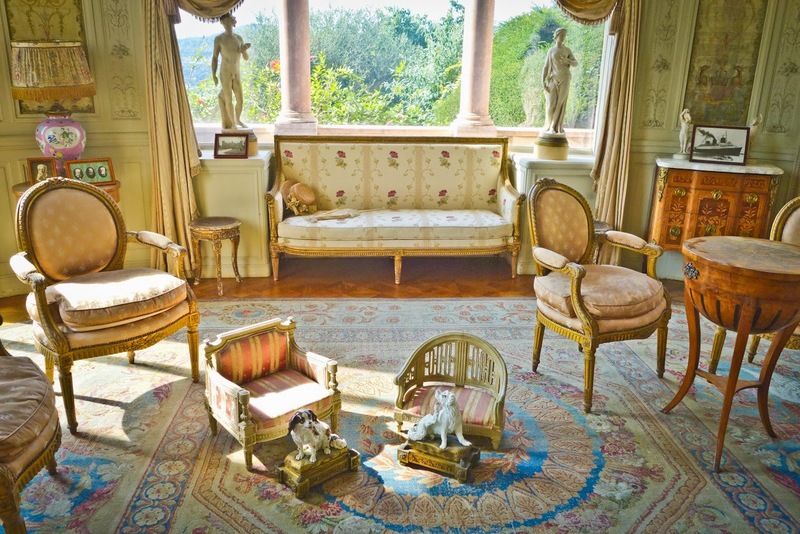 The rotunda of "Madame's room": chairs and 18th century silk window frames. The two smaller chairs on the floor were for her dogs. 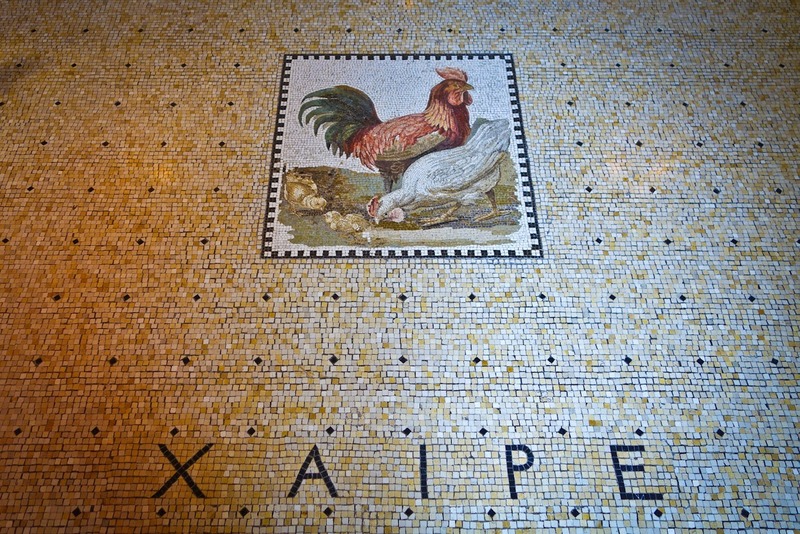 "Xaipe" Greek for "rejoice" represents the only instructions given to the visitor arriving at the Kerylos Villa. One of Béatrice’s dear friends Théodore Reinach (and cousin-in-law as his second wife was an Ephrussi), was also her neighbor. 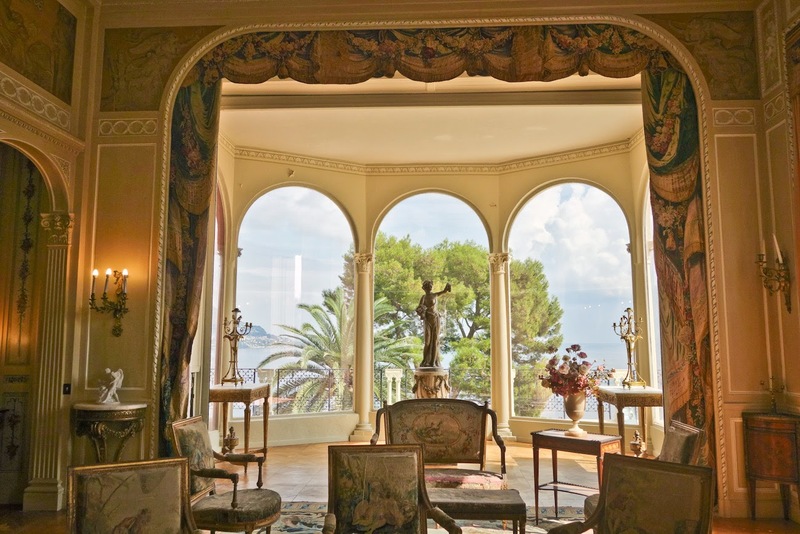 You can actually see his incredible villa from one of the many windows of the Villa The Ephrussi de Rothschild Villa. Although equally splendid, the two villas could not be any more different. 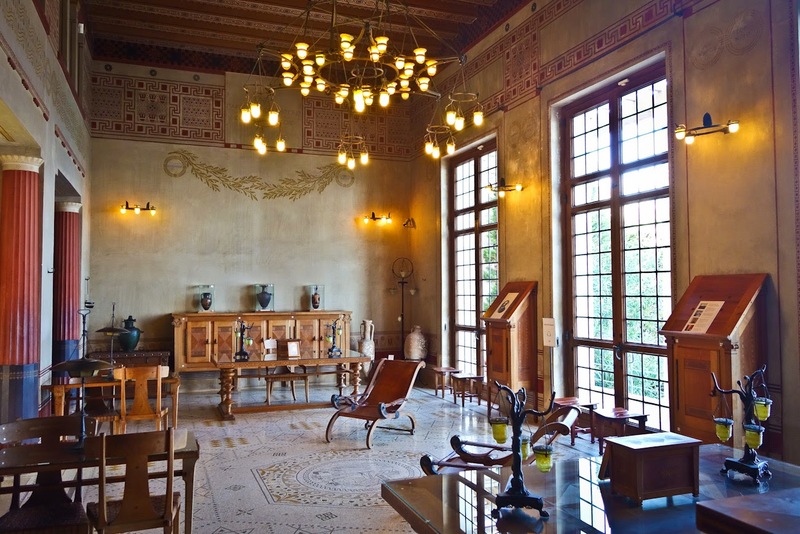 Known as a man with "encyclopedic knowledge", Théodore purchased a property at Beaulieu-sur-Mer with intentions to construct a villa modeled after the antique houses of Delos in Greece. The adventure in building the villa, which was named Kerylos (a Greek word, "Kerylos" means Halcyon or kingfisher which in Greek mythology was considered a bird of good omen), began in 1902 and cost 9 million franc. Théodore (1860-1928), a Doctor of Law and Doctor of literature, was also a well-known and highly regarded Hellenist (amongst other things), and was author of the first French translation of The Athenian Republic by Aristotle. He also transcribed and annotated music found during excavations at Delphi. He was the only scholar in France capable of carrying out such tasks as his philosophical culture equaled his vast musical knowledge. As a child, he was considered to be a prodigy. Théodore and his two older brothers, Joseph (a historian, politician and secretary to Gambetta) and Salomon (director of the Le musée des antiquités nationales in Saint-Germain-en Laye) formed a brilliant trio. Their combined initials – J.S.T.- were said to stand for “Je Sais Tout” (“I know everything”). 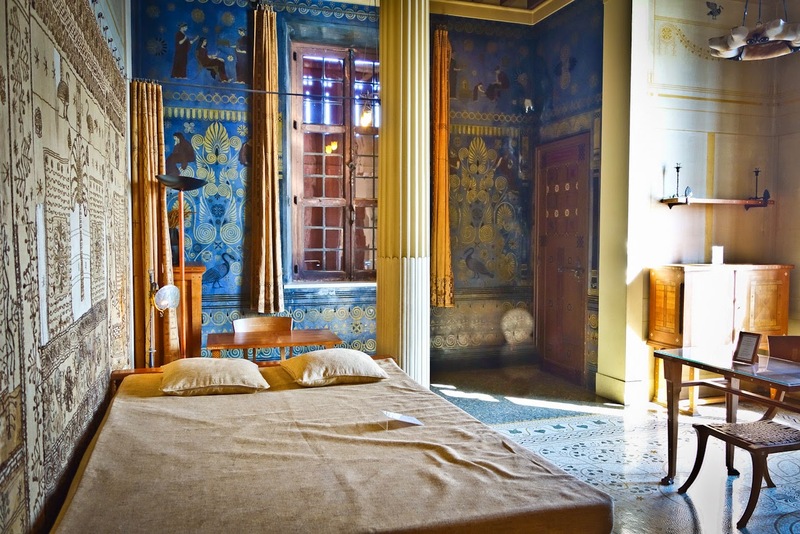 The exquisite villa Théodore built was a reinvention of the Greek homes of antiquity however was used as an authentic home with astonishingly luxurious wall decoration and furnishings. 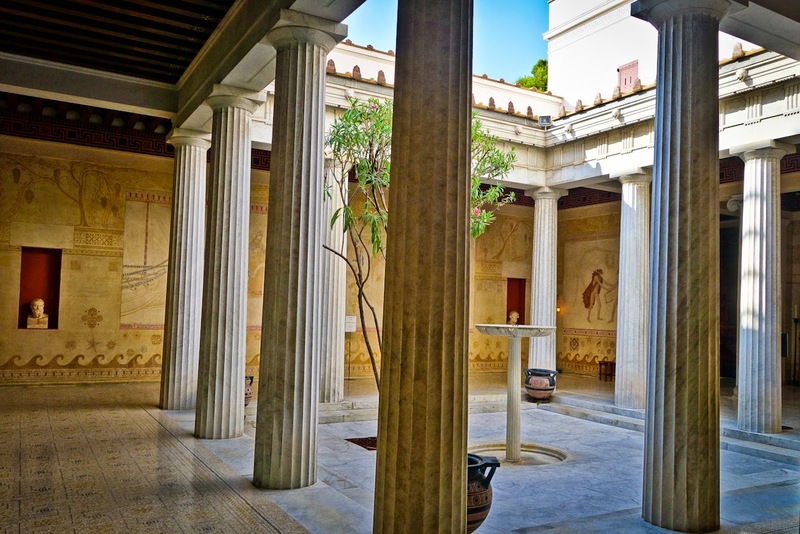 The architecture was modeled after the nobles homes on the island of Delos in Greece. The details of the villa are truly extraordinary and the patterns of the painted wall frescoes and the mosaics, as well as the design of the furniture and motifs for the tapestries were inspired directly from antique documents. The scenes of the famous vases are recognizable on the walls illustrating the great legends of the gods and classical hero’s. 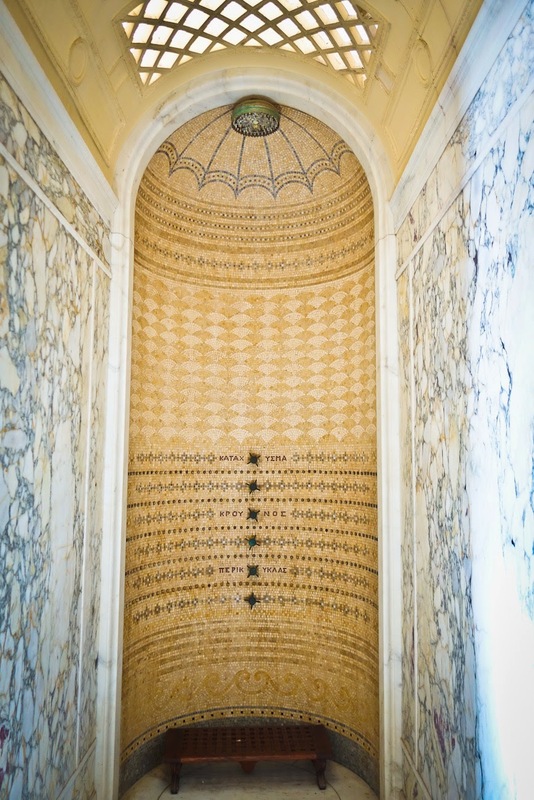 The rarest of materials were used: antique stucco, various colors of veined marble-commissioned from the most prestigious interior and decorative artist of the time. The Kerylos Villa is surrounded by a garden that includes a harmonious selection of Greek plants. It's no wonder Théodore entertained the likes of Isadora Duncan and Sarah Bernhardt, the space itself was/is surely an attraction. My personal favorite of the two, I could spend the whole day examining every detail of the villa! 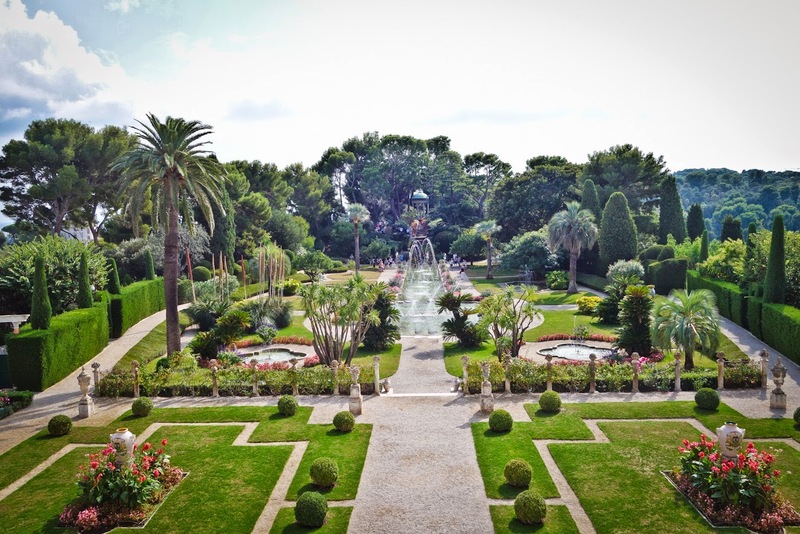 Like the The Ephrussi de Rothschild Villa, the property is managed and promoted by Culturespaces. The Villa is open to the public 365 day a year from 10 a.m to 6 p.m, except: July and August: from 10 a.m to 7 p.m. From November to February: from Monday to Friday from 2 p.m to 6 p.m. / weekends and holidays from 10 a.m to 6 p.m. The library faces east, according to the instructions of the Ancients, it is illuminated by 3 tall, wide french windows that open onto a terrace over looking the sea. The central chandelier, replica of the chandelier in the Sancta Sofia Church in Constantinople. The Triklinos, or the banquet hall: guests sat at couches woven in leather and dined on tripod tables placed in the middle of the room. This room was called Ornites (The birds) and is dedicated to Hera, Zeus's wife, goddess of marriage and femininity. Painted on the walls are symbols of Hera (Peacock feather). This room belonged to Theodore Reinach's wife, Fanny Kann. Although more Roman than Greek, this shower has a few modern refinements such as the possibility of taking a "rain shower" or "circular shower"
Theodore's room "Erotes" in reference to the wall decoration that represents winged Eros playing among the vine branches and the doves. 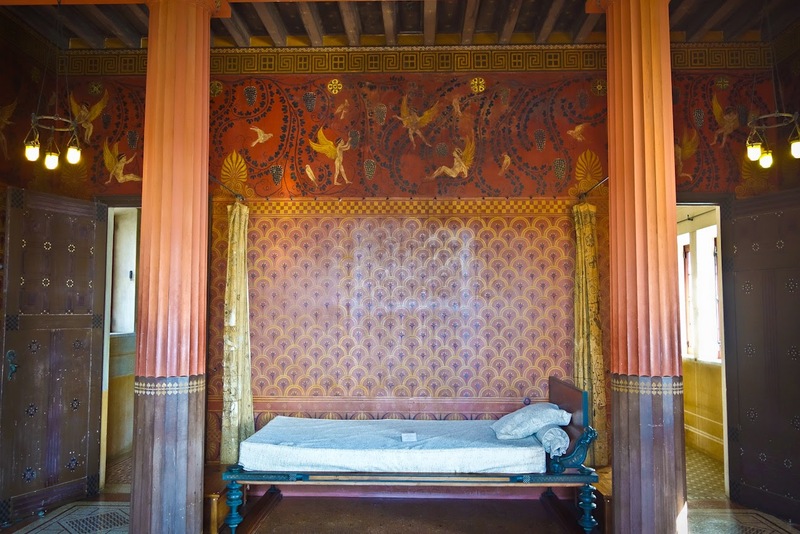 The bronze and wood bed, modeled after a bed in the archeological museum o f Naples, is severely framed by two grooved wooden columns, painted like everything else in the room in the style and colors characteristic if Pompeii. Entrance peristyle: Air and light circulate freely among the rose laurels, while a basin in the center reflects the fundamental role of water as the source of life. On the wall, mythological scenes and shell designs recall the indestructible links between the Greek civilization and the world of the sea. View from the east terrace of the house (although the sea completely surrounds the villa and one can see the sea from every location of the villa). 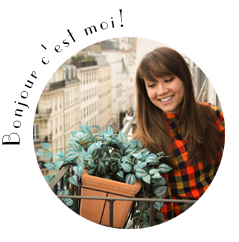 As you leave the villa make sure to check out Gustave Eiffel's villa right next door! (yes Théodore's neighbor was also his good friend, the French civil engineer and architect who built the famous La tour Eiffel). Mirabo Villas is located near the center of Santorini offering a luxury ... Like a house out of an island's fairytale Mirabo Villas is a three unit property that offers Cabo luxury vacation home rentals.